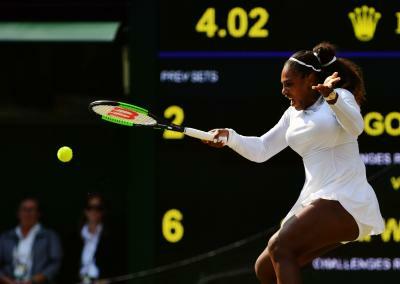 London July 13 (IANS) Serena Williams will make her 10th appearance at the Wimbledon final after beating No.13 seed Julia Goerges of Germany 6-4 6-2 in the semi-finals. Williams will take on Germany s Angelique Kerber in Saturday s final for the chance of winning her eighth title reports Xinhua news agency. Although Goerges put up a fight with her powerful forehand return winners the seven-time champion was unstoppable with five aces 87 percent first serve points won and four of five break points converted. Despite losing the match Goerges said she was proud of her performance in her first semi-final at the All England Club. With her victory Williams will be the first mother to reach the Wimbledon final in 38 years and the 36-year-old was emotional at the prospect of competing in her first final since the birth of her daughter in September 2017. "I had a really tough delivery and I had to have multiple surgeries. I remember I couldn t even walk to my mailbox so it s definitely not normal to be in a Wimbledon final. I m taking it as it is and just enjoying every moment " Williams said. Her rival on Saturday will be No.11 seed Kerber of Germany. The two-time Grand Slam winner edged Jelena Ostapenko of Latvia in a straight sets victory to make it to her second Wimbledon final.